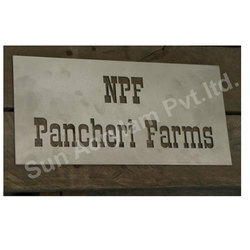 We manufacture Customized Industrial stencils as per requirements. 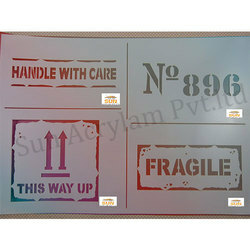 We also Provide stencils in Metal and Transparent sheet. Our stencils are reusable and suitable to paint. We provide delivery any where in India. 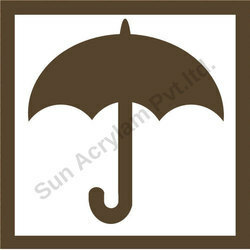 We Sun Acrylam Pvt. 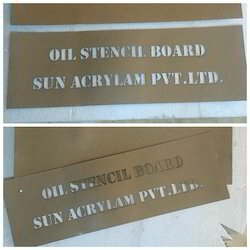 Ltd. are manufacturer of Various kind of Oil Stencil Boards. 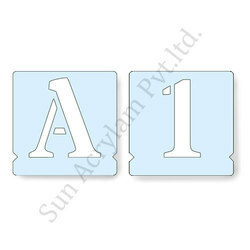 This Stencil Boards Standard size is 7"x22" It is very Suitable to cut through Stencil cutting machine. We are sending it through Courier with in guaranteed time limit. Our Stencil Board are Both side Poly laminated i.e suitable to paint. We are manufacturer of customised stencils for different kind of usages like drum painting, pallet paint or machine name plate etc. We are dedicatedly engaged in manufacturing and supplying a unique range of Stencil to our prestigious clients. 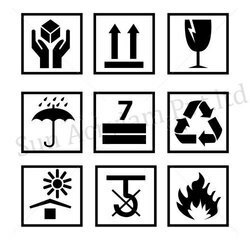 They are used as a base to create the artistic figures, numbers, alphabets or outlines and are mainly suitable to the chemical manufacture to mention company name, mfrd.date, expiry date, company logo, net weight etc. It is manufactured using premium grade raw material procured from trusted and reliable dealers. Stencil can be used with paints, colored pencils or spray color for better results. Additionally, it is available in different shapes, patterns and sizes to meet the client's requirements. Available in more then 5000 designs. Lots of options for sizes. 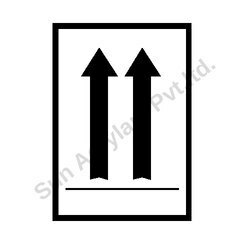 Metal Latter Stencils offered comes in quality construction finish and can be made available in different metal choices like stainless steel, aluminium and other options. Providing for long term usage, these stencils come with brushed or polished face and sides. 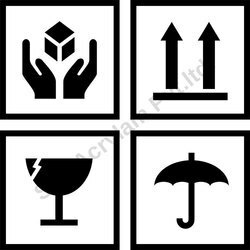 Some of its features include these metal etching stencils are easy to work with, cost effective to use, easier and faster output, suitable for use on walls, floors, ceilings, furniture, fabrics. We provide various designs in In industrial Stencils. These Stencils are reusable and washable. It is very popular to print on corrugated box printing and also wooden box painting. We provide customised stencil for Branding on Wood box or corrugated box. We also provide stencil for Company Logo. 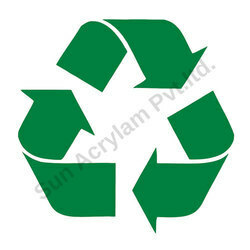 We Sun Acrylam Pvt.Ltd. are the manufacturer of Various kind of Stencil Boards. We provide different sizes in Oil Stencil Boards. Our Boards are very popular in Industrial Stencil cutting Machine users. 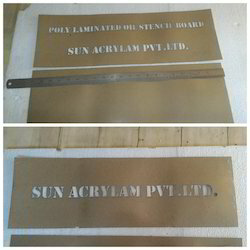 We Sun Acrylam Pvt. Ltd. are manufacturer of various kind of customized Stencils. 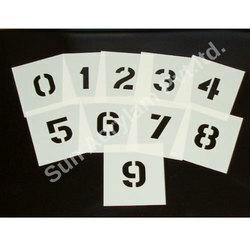 We can provide stencils for your logo and also for required name and numbers. We can provide it in customized size and Shape. We have a large experience for stencil manufacturing. So, we will provide you the best Stencils at lowest rate.